Whose grandma (or parents, if you have old parents like me) didn't watch The Lawrence Welk Show? Oh man, it's SUCH a time capsule, and doubly so. It's not just 1970 or whatever specific date the episode you're watching was taped. It's a time capsule of what was old-fashioned even in 1970whatever. Not that there's anything wrong with that, as Seinfeld would say. There's something so wonderfully charming about any Lawrence Welk clip. The host himself, with his "wunnerful, wunnerful" accent. The singers, with beautiful voices and clothes straight out of a square-dance supply store and lyrics clean-cut enough for any nun. And now let's listen to Gail (not me! Gail Farrell, who later did some voice work in "The Little Mermaid") and Dale (love when he gets all bassy) and "one of the newer songs." 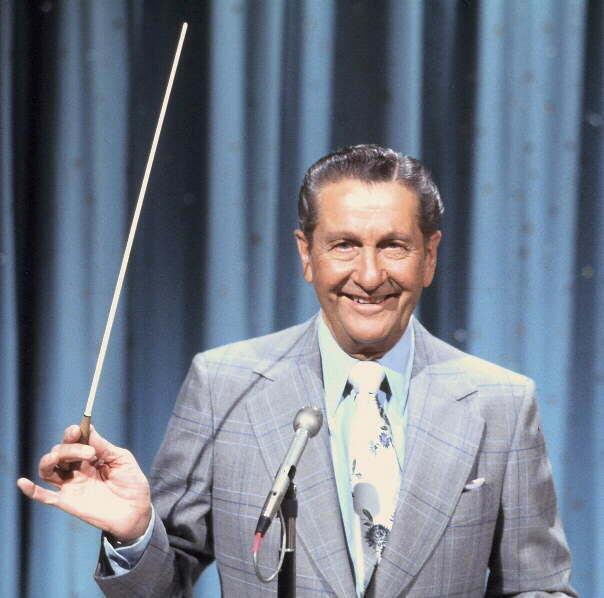 And share your memories of Lawrence Welk in the comments. Oh man. I used to watch this with my grandparents every week. I'd pin one side of my nylon nightgown up and dance along with Bobby on whom I had a big crush (I was born in '71, so I was very young). I love watching it now because it's so cheesy, but they are so sincere! About 10 or 12 years ago, the touring show, "Stars of the Lawrence Welk Show" came to my small city of Augusta, Maine. So I went, because I love the show; it makes me feel all back-in-my-parents-living-room. Well, I never saw so many buses in my life; they must have emptied out every old folks' home from Portland to Bangor. I was about 35, at the time, and the ONLY people there anywhere NEAR my age were caretaker types. I have never before been in a room where the collective age of the population exceeded a billion. The best part was, all these elderly people STARED at me, like I was some kind of freak, and finally the guy next to me asked what was I doing there (I resisted the temptation to say I was Bobby Burgess's love child). And I'm thinking to myself, geez, the show didn't go off the air until 1982, the real question is, where are all the people BETWEEN my age and yours? So you are right, it was old fashioned even back in the day. I always associate Lawrence Welk with extremely elderly people... and therefore with illness and death. When my grandmother was in a nursing home in the 80s and early 90s, I can recall EVERY TV on her wing being tuned to the Lawrence Welk show on any given Sunday evening. Funny thing was, it aired on PBS, and right after it came the Benny Hill show -- which was as raunchy and crazy as Lawrence Welk was straight-laced. So all those old folks invariably got a healthy dose of off-color British humor in addition to "wunnerful, wunnerful" music. I used to spend most Saturday nights as a kid at my grandparents, where we always watched Lawrence Welk, right after Hee Haw. 35 years later, Hee Haw is long gone, but Welk STILL airs, in the SAME time slot. True story: About two years ago, my entire family was at my house for my birthday. To appease all of the channel surfers, I put on the Lawrence Welk Show because it seemed the safest thing to do at the time. My Grandma was very excited and then realized that she had seen the one of the singers before. So she leans over to my Dad and says, "I think this is a repeat". My poor Dad snorted so hard that he almost choked on his soda, leaned over to me and said, "of course this is a repeat, Lawrence Welk has been dead for years!" I had the same experience. Saturday night at my grandparents so they could take me to Sunday School and we watched Hee Haw and Lawrence Welk every week. "One Toke Over The Line" was performed for the The Lawrence Welk Show, a television program known for its conservative, family-oriented format, by a duo known as "Gail and Dale." At the conclusion of the performance of the song, Welk remarked, without any hint of humor, "There you've heard a modern spiritual by Gail and Dale." The Vice President of the United States, Spiro Agnew, named us personally as a subversive to American youth, but at exactly the same time Lawrence Welk performed the crazy thing and introduced it as a gospel song. That shows how absurd it really is. Of course, we got more publicity than we could have paid for.